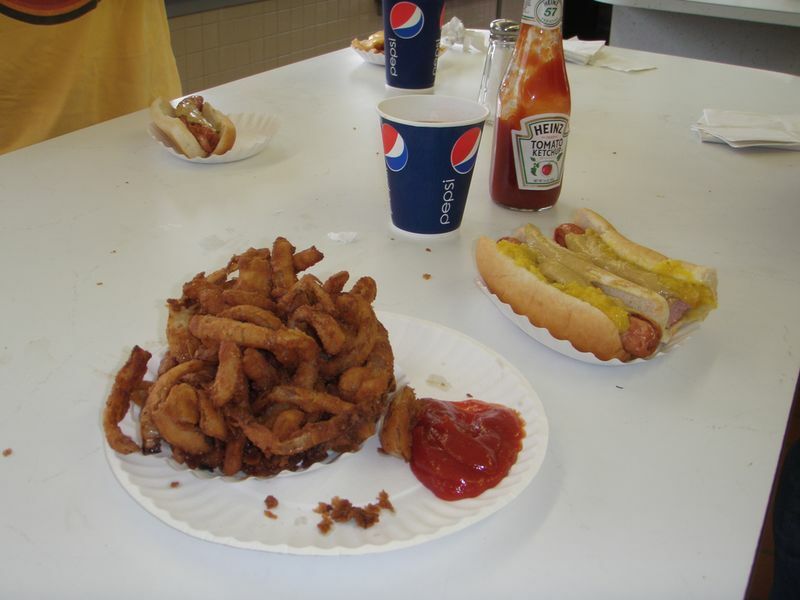 HomeReturn to Rutt’s Hut for the Rippers! 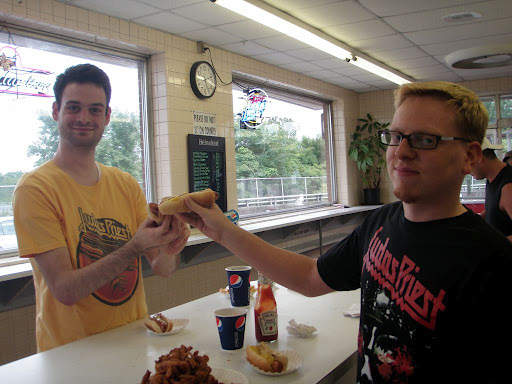 Return to Rutt’s Hut for the Rippers! 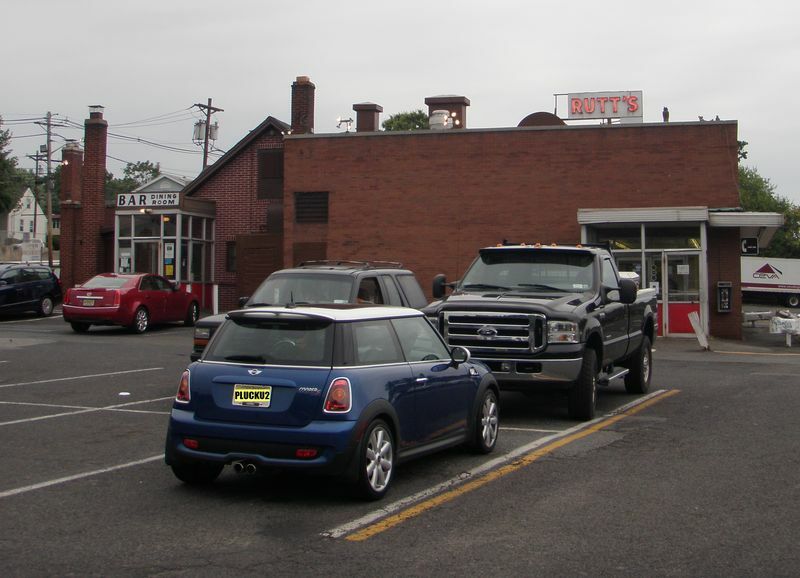 Rutt’s Hut is a north Jersey institution. Hot dogs cooked in a deep fryer until the casing splits open, and they are deemed “rippers.” Onion rings fried to a greasy mess of deliciousness. And most importantly, their own language behind the counter. Want a Yoo-Hoo? You’ll get a marlvis. Want them fries to go? Two rippers, Frenchy one, traveling! One marlvis, cap! That’s part of the charm that makes their crispy fried dogs and their unique yellow relish so memorable. Rutt’s Hut was one of the first entries in the Greasy Spoons catalog, and we’ve come a long way baby. So we returned, on the eve of a Judas Priest concert, to have some rippers, in hope that the band would play my favorite song, “The Ripper.” And by jinkies, it worked! For those not familiar with the Hut of Mr. Rutt, it was opened in 1928 by Royal, aka “Abe” Rutt and his wife Anna. My 89 year old great-uncle Jimmy remembers going there with his wife before they were married. And they still serve the hot dogs the same way. They are an acquired taste, but once you acquire it, nothing else will do. 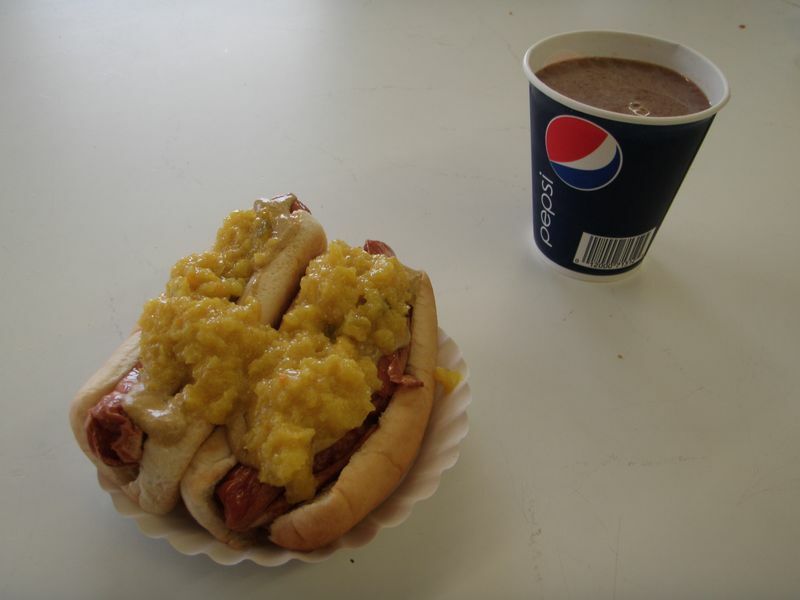 The crispy skin of the fried hot dog, the juicy center, the no-frills soft bun cradling the dog slathered in yellow mustard and their one-of-a-kind yellow relish made from ingredients unknown, but sure to contain purest manna from heaven. I’m told it contains cabbage, carrots and onions from Wikipedia, but until I see a spectrometry test I’m not budging. Their fries are always crisp and golden; the onion rings have changed through the years, always a bit dark and overcooked as seen here. But a huge improvement from how I remember them as a child- the batter peeling off, leaving you a soggy fried mess of onions and crispy batter pieces. They also serve chili, but for some reason I’ve never had a chili dog here. The relish stands on its own. They also serve chicken, shrimp, burgers, the ubiquitous Taylor Ham, beer, and more, but nothing to write home about. The bar in back is a classic Old Man Bar (as defined by Weird NJ) and serve dinner specials; you can get hot dogs back there too, if you want a cold one. You can hear me singing in the video! Uh, that 'yellow stuff' is called remoulade here in Denmark. We eat it on hotdogs, fried fish and in roastbeef sandwiches. We love it :-)I have made it myself several times. Boil cauliflower, carrots, cabbage, onions and cucumbers (all chopped finely) in applejuice. Season with salt, pepper, mustard powder and a little vinegar. You've solved the mystery! The apple juice must impart the sweetness. I wonder if Mr. Royal Rutt was Danish, perhaps he shorted his name. I will definitely try making this at home. Thanks so much!